The company already ran a successful signage and print business, but when they saw a sample of Stadur VisCom Sign SF, it ignited a passion for the product that continues to grow. 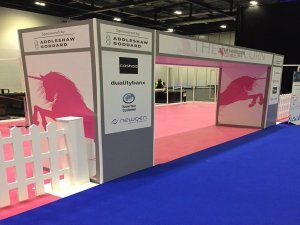 Impressed by Stadur VisCom Sign SF’s rigid but lightweight structure, they recognised that it could help them to expand their product portfolio to include bespoke stands for events and displays. 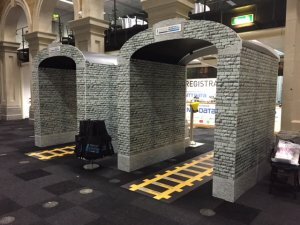 From early trials, they have gone on to produce simple blocks and walls to more complex 3-dimensional structures for customers’ events and displays. 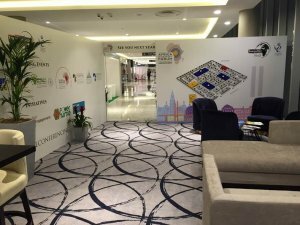 After first meeting with clients to understand their concept, Jaguar Design & Print will then explore the best ways to produce the stand, typically using Stadur VisComm Sign SF 10mm board. Once the client has approved the mock-ups and proofs, the printing and cutting process begins. They print the Stadur board on their Arizona 1260GT flatbed using UV inks. Once all the boards are printed, they are checked and trimmed to size. Wooden box frames are then made and bolted together to which the Stadur is then affixed. A trial build is carried out before final installation of the stand to make sure everything is just right. Jaguar Design & Print also have plans to experiment with Stadur VisCom Easyprint after being impressed with the product’s folding capabilities, adding even more scope to the stand options they can offer their customers. Stadur Viscom Sign SF is a lightweight foam board with an extruded polystyrene core and high-quality 1mm Foam PVC liners either side. It can be UV digital and screen printed and is also suitable for the application of vinyls. With a very low weight – 5mm Stadur board is 40% lighter than standard Foam PVC and 10mm board is 60% lighter – it is also rigid and dimensionally stable. Weather and humidity resistant, it is suitable for indoor and outdoor use. Stadur Viscom Sign Easyprint is light, rigid, PVC-free, foam board, suitable for interior and exterior use. Comprising of Stadurlon (non PVC) sheets on both sides, Easyprint is optimised for digital printing and finishing and can be bent and folded without breaking. Milling V-shaped grooves enable the foam board to be easily foldable by hand, while milling slot grooves, allows various geometrical shapes to be generated, giving free reign to creative design options.